Passenger operator Metra has revealed a special livery for one of its F40PH locomotives to mark 40 years of service in the United States. 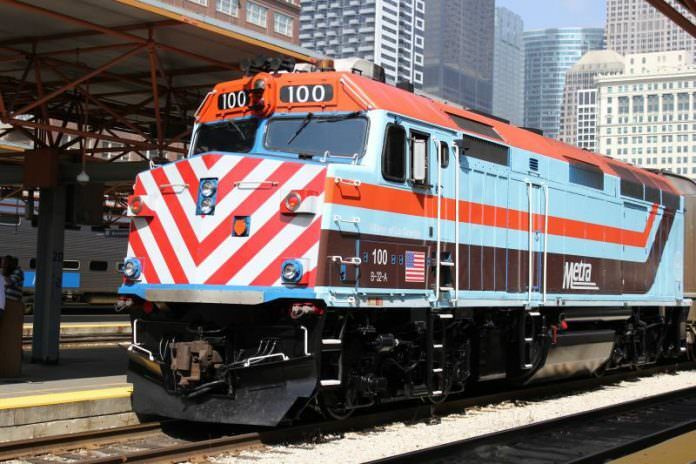 The new livery was unveiled on Metra locomotive No. 100 and replicates the locomotive’s original colour scheme when it first entered service in Chicago on September 30, 1977. Metra CEO Don Orseno said: “These F40PHs have been in commuter service longer than any other locomotive type in North America. Bruce Nelson is a member of the Shore Line Interurban Historical Society, which paid for the new livery. He added: “I’m not sure anyone could have predicted in 1977 that the locomotives then being delivered would still be in everyday use after four decades. “How many people drive a 40-year-old car several hundred miles every day at speeds up to 79 miles per hour? EMD, or the Electro-Motive Division of General Motors in La Grange, Illinois, developed the F40PH for passenger service. More than 500 of these locomotives were produced for the North American market. The RTA’s Commuter Rail Division, which later became Metra, began taking delivery of the first 28 F40PHs in 1977. Orders were subsequently placed four more times for a total of 115 locomotives, with the last delivered to Metra in October 1989. Over the years, Metra acquired three additional former Amtrak F40PHs for a total of 118, making it the world’s largest fleet of this locomotive type. Most of Metra’s F40PH fleet have undergone in-house rehabilitation. Beginning in 2008, 50 of the F40PH units underwent a more extensive overhaul by Progress Rail Services at their Mayfield, Kentucky, facility where these locomotives were essentially rebuilt. In 2015, a second overhaul program for the F40PH and F40PHM models started at Progress Rail’s Patterson, Georgia, facility. The Metra system currently operates 149 locomotives with 28 being the original F40PH models.